PROVO, UT--(Marketwire - Aug 29, 2011) - Ancestry.com, the world's largest online family history resource, today announced an entire week of free access to its popular U.S. and International Immigration and Naturalization records. The free access week begins August 29th and runs through the Labor Day holiday ending September 5th. During this time, all visitors to Ancestry.com will be able to search for free the indices and images of new and updated U.S. immigration records as well as selected international immigration records from the United Kingdom, Ireland, Italy, Australia, Canada, Germany, Sweden and Mexico. Millions of Americans can trace their family history to other countries, and these collections provide valuable information about the travels and journeys that brought them to America or other countries around the world. Ancestry.com's extensive collection of immigration, naturalization and travel records offers an important resource for discovering and celebrating family history. As part of this promotion, the company is adding to its collection of U.S. and international records for tracing relatives from their homeland to other countries around the world. These records include ships passenger and crew lists, declarations of intent, petitions for naturalization, witness affidavits, border crossings, certificates and other records generated by the naturalization process, which is the act and procedure of becoming a new citizen of a country. Because the process has changed significantly over time and varies from country to country, different records are available from a wide variety of state, federal and international sources. We know as genealogists, the more research you do, the more you learn. Sometimes what we learn refutes what we thought we knew. This article is a case in point. As we celebrate the Sesquicentennial of the Civil War, it talks about examining the records of those soldiers from NC who died while serving in the Civil War – the results were not what the researcher expected to find. “For more than a century, North Carolina clung to a pair of Civil War distinctions thought sacred: It sent the first Confederate killed in battle, and it sacrificed 40,275 men - the most in the South. · The war killed about a quarter of the state's men of military age. More died of typhoid fever and chronic diarrhea than bullets. Some even died of spider bites and lightning strikes. “The new Family History Library microfilm ordering system is continuing to roll out to new Family History Centers (FHCs) in the United States and Canada, retiring the old Inventory Manager system which required you to physically visit the FHC to place your order. July 27th [was] the magic day for California and the remaining western/northwestern U.S. states, with the rest of the United States and Canada to be rolled out in stages throughout the remainder of the year. Check films.familysearch.org and search for your state to see what's available -- and keep checking back because new centers are coming online every few weeks. Editor's Note: FamilySearch officially sent out a press release on 10 August 2011 to announce the availability of online film ordering to the U.S. Northwest/West Area. This also states that on 24 August 2011, this service might also have become available in the Southeast. Please post a "comment" if this is true. Editor's Note: Those of us in Raleigh (NC) received an e-mail notification on 26 August that we could now use the online order service and Sharon Tate Moody has reported the same for Florida. National Association of Government Archivists and Records Administrators and the Council of State Archivists Annual Meeting -- Learn the challenges faces by archives and what they are doing in response! Though most genealogists are not professional archivists, we do maintain our own archives and also have a great interest in any archives or repository where original records can be found. An annual meeting held relevant to archivists is the “National Association of Government Archivists and Records Administrators and the Council of State Archivists Annual Meeting.” The most recent one was held in July of this year. Just by reading the program, you learn a lot about the issues facing archivists, new technologies on the rise and so much more. Additionally the NARA blog posted a follow-up talking about a session on the 1940 census (mentioned above) and the bottom of that post lists several resources you might want to check out regarding the soon-to-be-released 1940 census. Editor’s Note: If you haven’t read yesterdays UpFront with NGS post, also on the 1940 census, do check it out. I regularly check out Nu? What's New? The E-zine of Jewish Genealogy From Avotaynu (Gary Mokotoff, Editor) for news. Though it’s labeled as for those doing Jewish Genealogy, I often find great information of general interest to any genealogist as well as those researching Eastern European-born ancestors. Volume 12, Number 29 | July 24, 2011 included this bit of news that will interest anyone awaiting the release of the 1940 census. Consider signing up for this E-zine. It is free for the first 30 days (four issues) and thereafter the cost is $12.00 per year. Back issues are available on the site and you can access up through Vol 12, Number 25 as this posting is made. Editors Note: If you have not previously explored the aforementioned Steve Morse website or not revisited it recently, it’s always worth checking out to see what new and useful tools he has posted. Following successful offers made earlier in the year at Family History Fairs in London and York, England, and Colorado, USA, the international Guild of One Name Studies will be making a similar offer at the NZ SoG’s New Zealand Family History Fair in Hamilton on 26-27 August. 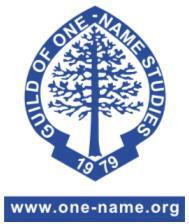 Normally, membership of the Guild of One-Name Studies costs either £15 sterling or US$25.00 (or equivalent in NZ$) for 12 months membership. This offer covers membership for 15 months with renewal not due until 1 November 2012. Visitors to the Fair at Hamilton can call at the Guild of One-Name Studies’ stall where questions about the Guild and this offer will be welcomed. For those unable to get to Hamilton, the extended membership offer will also be made globally for the whole of August, during Family History Month. Go to the Guild website at: www.one-name.org/nzfhf-offer.html. 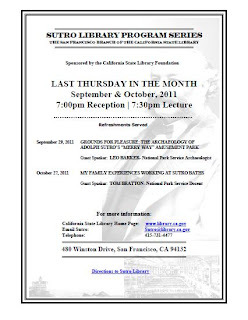 Sutro Library, the San Francisco branch of the California State Library, announces two evening programs to be held on the last Thursdays in September and October. These programs are free and open to the public. Receptions with light refreshments will begin both evenings at 7:00 pm; the lectures start at 7:30 pm. The Sutro Library is located at 480 Winston Drive in San Francisco. Directions to the Library are posted on Google Maps. 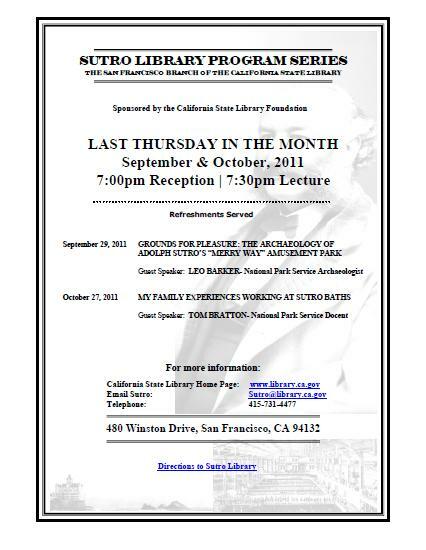 For more information, please contact the Sutro Library directly at (415) 731-4477 or [email protected]. The Middle Tennessee Genealogical Society and Tennessee Historical Society sponsors its 25th Annual All-Day Genealogical Workshop. Elizabeth Shown Mills, CG, CGL, FNGS, FASG and FUGA will speak on: "Problem Solving in the Problem-Riddled Carolina Backcountry". J. Mark Lowe, CG, FUGA, a professional genealogist, lecturer and author, Topic: "Inheritance Laws and Estate Settlements in the Carolinas". 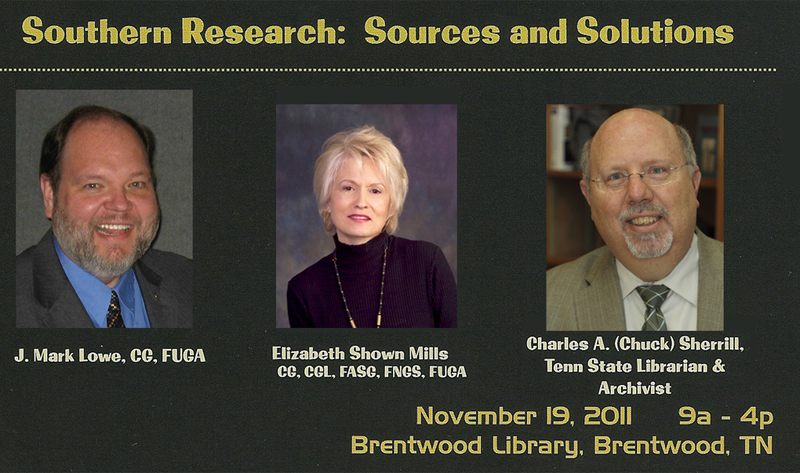 Charles A. Sherrill, M.A., M.L.S., State Librarian and Archivist of Tennessee, Topic: "Service Records/Civil War. Sat. 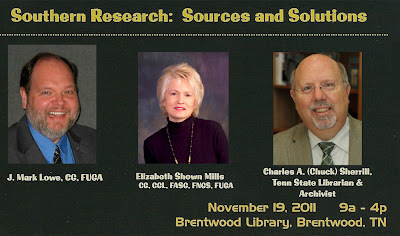 19 November 2011, 9:15 a.m. -- 4:00 p.m.
For detailed information, registration, and payment, please visit our website, www.mtgs.org for details. Julie Miller, vice president of the National Genealogical Society, is quoted in this article published 27 July 2011 in the Chicago Tribune. “Like a power outage brought on by a summer storm, genealogy unites families, instantly transporting them to a distant, pre-electricity past — only without the worry of what will happen to the perishables in the refrigerator. For kids growing up in the well-lighted information age, what better way to broaden their myopic view than by pointing to the past? Why the change? As we refocus our efforts on gathering the best online collection of military records and stories we wanted a name that would reflect military history and honor. Traditionally, the third fold in a flag-folding ceremony honors and remembers veterans for their sacrifice in defending their country and promoting peace in the world. Read more about the change on the fold3 (previously Footnote) blog. OAKLAND, California–July 25, 2011–The California Genealogical Society (CGS) announces publication of Raking the Ashes: Genealogical Strategies for Pre-1906 San Francisco Research, second edition, a guide to circumventing the enormous record loss in the 1906 San Francisco earthquake and fire. 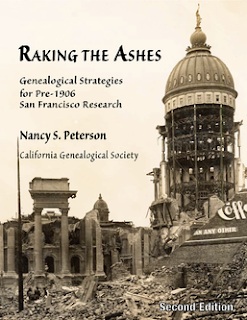 This authoritative book by Nancy Simons Peterson, Research Director at CGS, is a must have for researching San Francisco ancestors, providing invaluable guidance on which records were lost in the 1906 earthquake and fire, which records survived, and where to find them. Peterson alerts the reader to lesser-known sources, recently published references, and newly discovered documents. Sources are clearly identified and evaluated, while graphics, statistics, and historical background enrich the text. Not limited to San Francisco, Peterson's solutions for working around lost records and her emphasis on casting a much wider net than is customary will be especially welcomed by researchers wherever natural disasters have destroyed historical documents. First published in 2006, the second edition has been substantially updated and expanded. Nancy Simons Peterson is a certified genealogist and author of numerous articles. She holds undergraduate and graduate degrees from Stanford University.